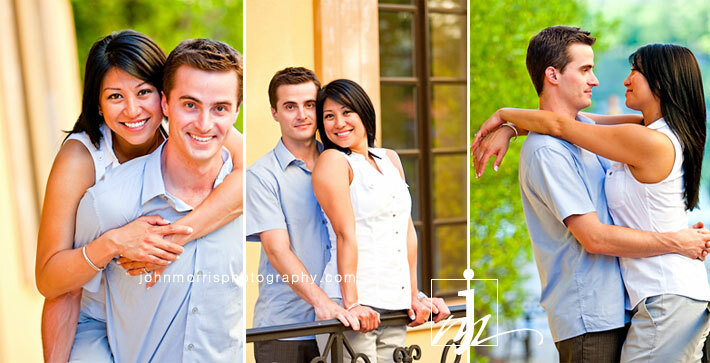 Here are several photos from our engagement photo shoot with Marc and Venice last week. 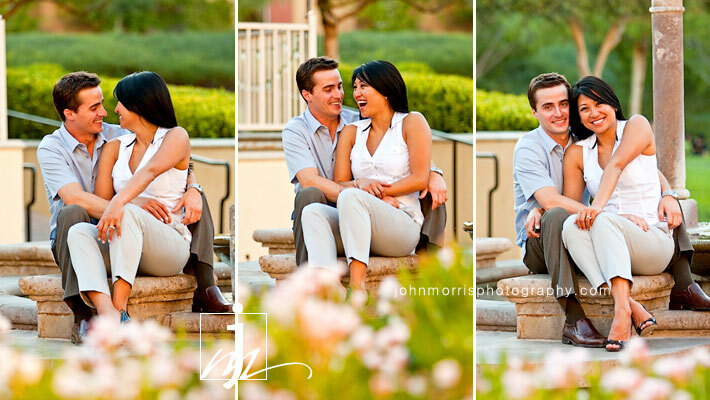 They are such a cute and fun couple, not to mention extremely pleasant to work with. Once things got rolling, we completely lost track of time. When the sun began to set, we realized that hours had passed by. I could have continued to photograph for a few hours more. I definitely look forward to capturing their wedding in December. Their wedding ceremony will take place at a local church here in Las Vegas. I have always enjoyed photographing church buildings because they are such beautiful structures. I especially love old church buildings – there is something so tranquil and inspiring about them. It wasn’t hard to tell that these two are a perfect pair. On a few occasions I took a step back in order to capture them interacting naturally with each other. Before wrapping up, I caught them chatting intimately by the water. The lighting was gorgeous so I took a few shots creating the beautiful images below. It was really hard to pick our favorite photos because there were so many favorites to choose from! It had both my mom and I in tears! We will be using one of these pictures for our save the dates. Thanks Marc, Venice, and “mom” for the wonderful compliments. You guys are fantastic and I’m sure your guests will love those save the dates! 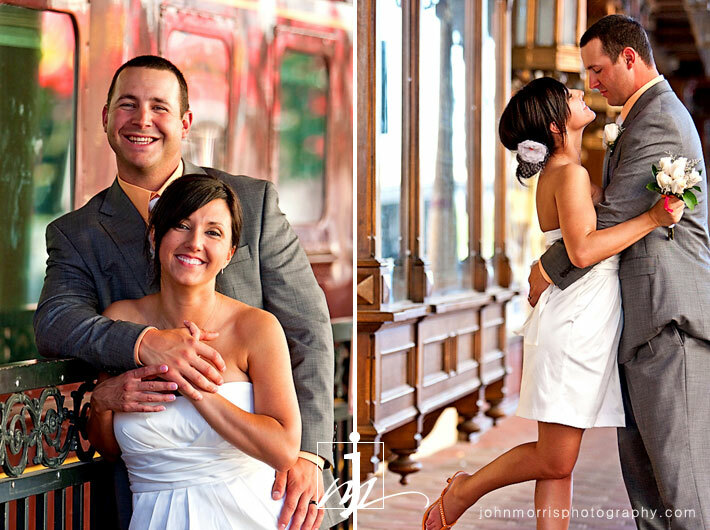 Check out this promo slideshow of some of our favorite Las Vegas weddings from 2009-2010. JMP Promo Video from John Morris Photography on Vimeo. Abbie and Kyle came to Las Vegas from the Midwest to have a fun and intimate summer wedding. They were referred to us by their friends and our former clients who were married here last year. It’s always such a compliment when clients are so happy with our work that they tell all their friends about us. After seeing the romantic, lifestyle images we took of their friends in Downtown Las Vegas, Abbie and Kyle fell in love with our photography. They wanted to do something similar, so right after their wedding ceremony we took them to Fremont Street where we had a great time capturing beautiful, artistic images of the newly married couple. Their fun and colorful attire matched their charming personalities. The bride’s choice of a cute, short wedding dress was ideal for a summer wedding. It even had pockets – talk about stylish and practical. The splash of orange in her shoes and the groom’s shirt tied everything together nicely, although it did help that these two are a pretty good looking pair. We wrapped up the shoot right after sunset, just in time to give the couple a mini tour of The Strip. It’s fun watching how people react to all the sights and sounds of Vegas. It can be quite overwhelming, especially if it’s your first time to the city. Having lived and worked here for years, I sometimes forget what an exciting city Las Vegas is. For our visiting couple, there was so much to see and do that they couldn’t fit it all into one trip. Of course, we were more than happy to give them suggestions on what was worth seeing and what to avoid. As long as they took our advice, I’m sure they had a great time. Abbie and Kyle, thanks for being so wonderful to work with. We hope to see you back in Vegas again soon.